I guess it was inevitable that I would be an off road riding enthusiast. As a small boy I loved to hear my father’s tales of riding through Africa on a 500cc BSA M20 just after WW2, when riding pretty well anywhere out of town in Africa was an off road adventure. Dad tells many wonderful stories, but one that stuck in my mind was of how touring in desperate heat he was the only vehicle to make it through a particularly bad stretch of sand and dirt road. He reached a remote town just on dusk, one of the few vehicles to get through in several days as it was so hot that the petrol in cars and trucks would evaporate before it reached the carburettor. Dad was immediately carried shoulder high from the saddle by a crowd, still covered in red dust, into the pub where he was not allowed to pay for drinks, all night. These stories were later reinforced by copies of English motorcycle magazines fed third hand through a family friend. All through the 1960s I avidly consumed a weekly diet of scrambles and trials, and trials in those days were not only the feet up stuff, but also included the multi day endurance events like the ISDT (ISDE) that we now call enduros. My heroes rode thumping big BSA, Triumph, Matchless and Ariel four strokes, the likes of Jeff Smith, Arthur Browning, Sammy Miller and in the long distance stuff, Ken Heanes, John Giles and Roy Peplow. Then of course came film actor Steve Mc Queen, a Hollywood star who, to add icing to any boy's dream, was no show pony, this man really raced dirt bikes and was actually good at it. Naturally I started a pestering programme on my parents and in the hope that eventually they would give in, also took up a paper round to raise some funds. Let me add that in the 1960s there was no show of any parent I knew funding their darlings into any kind of transport beyond a push bike. My first ride on a motorcycle was in a sloping North Shore garden on a 125cc BSA Bantam and it proved as alarming as it was exciting. The upslope posed no problem as the Bantam had minimal power, but as I swung downhill I discovered quickly how much heavier a motorcycle was than a push bike as the BSA seemed to rocket downhill on the wet grass towards the wooden boundary fence. Luckily instinct took over and I did the only thing possible, banking the Bantam into a desperate turn. It was probably also lucky that the small lemon tree I smashed through also scrubbed off a bit of speed. Not a great start you might think, to a life of motorcycling. My lucky break came from having to change to a more distant school and the lack of buses in that direction. "Ah, I said. Perfect solution, I could get a motorbike" Who could argue with logic like that? In a matter of months I was on two wheels and riding to school - and let me say again, in those days you needed permission from GOD to ride a motorcycle to school. In my dreams I would have been riding a thumping big 500cc BSA Gold Star, or perhaps a Triumph Bonneville. Of course I was not, my budget was BSA Bantam sized, a 175 cc three speed two stroke of very modest performance and somewhat smokey character, but it was a motorcycle and it was mine. My first Adventure was on the Bantam when still at school I teamed up with a mate for a holiday ride from our homes on Auckland's North Shore, into the backblocks of Northland. The ride was made infinitely more challenging by the fact that we were so low on power that all the traffic was flying past inches away from us. After an hour of crawling along the gravel verges of Northland's hilly Highway One we instinctively made for the traffic-free gravel back roads that interlace the region. Here we could buzz along in peace at 60-70kph. The bonus was that for all their lack of power and hopeless gear ratios, the Bantams, with skinny 19 inch wheels were rock-stable on gravel. For the next week of our holidays we wound through the backblocks, exploring beaches and nosing up any likely looking tracks we discovered, sleeping under the stars if fine, or in hay barns when it rained. That was a good start and my life has felt like one big adventure ever since. Inevitably I became interested in offroad racing, first motocross, or scrambles as it was called then. However much fun it was racing around paddocks my passion was for the more varied challenge of true cross country terrain and after years of reading about ISDT and enduro type events it seemed strange that there were no such competitions here in NZ. The only solution seemed to be to organise an enduro and see if anyone would come, so in 1974 I did so and the riders also came. To my joy it seemed that other enthusiasts around the country in that same year were also feeling the need and starting to organise events. Enduro in NZ was underway. Taking on small amounts of responsibility inevitably leads to more and the next two decades were spent organising and promoting National Enduro competition, setting up the first Woodhill Bike Parks, founding Kiwi Rider Magazine and then the job of editing and co-publishing the magazine from 1984 to 2006. My next big project was NZ Adventures, a company that enabled myself and a group of enthusiasts to develop new Adventure events designed to show others the hidden corners of NZ's remarkable back country via multi-day Safaris and guided trail rides. In my visits to the far-flung corners of our country I met the people who power the back-country, farming and husbanding the hills and mountains with tireless energy. Almost without exception these landowners were willing to share their beautiful properties with those with a geniune interest and respect for it - even I must add those doing so with two wheels and an engine. Over the years I have either organised, or attended, hundreds of Adventure, Trail and Enduro rides across the country and test ridden pretty well every every dirt bike made in those eras. In the process I have gathered a vast number of ride photos, related bike tests and articles, many of which were not published, mainly for reasons of lack of space in the printed media. E publishing does not have these same space constraints and I can indulge my own particular dirt bike interests at length. Through this website I plan to archive those images and material. In the process I hope this will help to document and make accessible for all enthusiasts words and images of what have probably been the best decades for off road riding. Though my racing days are memories and tales getting taller, and I have passed on the worry and stress of organising events to others, the thrill of riding off road remains with me, I hope for many years to come. ps. My memory is by no means infallible, so if I have got a name, or a date, or a place wrong, please don't hold it against me. 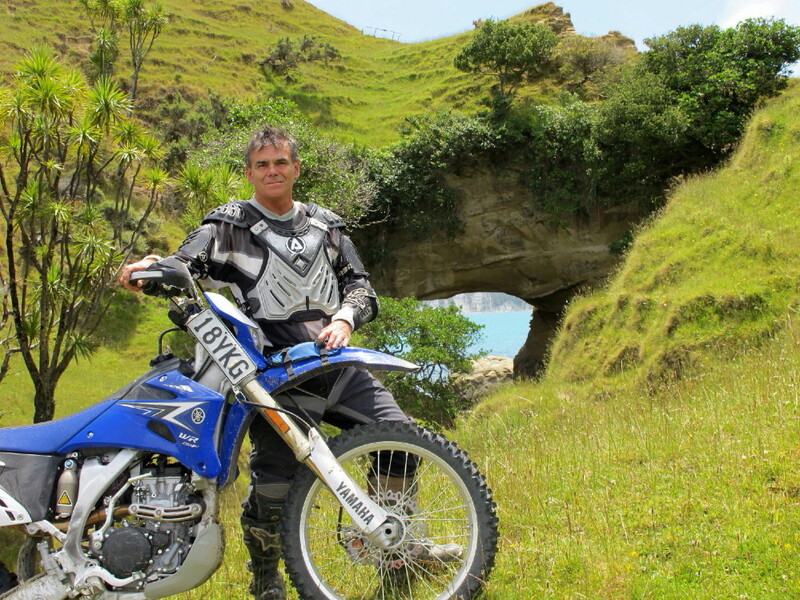 Better still send me a message on jnick@nztrailrider.co.nz so any mistake can be corrected.